Propriété 1: Appartement ensoleillé avec de belles vues, juste à la lisière de la forêt! Propriété 13: Maison de vacances 5 étoiles en famille ou entre amis à Bad Wildbad. Propriété 14: Bienvenue chez de bons amis! Ferienwohnung, 55 qm, 1 Schlafzimmer, max. 3 Pers. Propriété 33: Ferienwohnung, 55 qm, 1 Schlafzimmer, max. 3 Pers. Propriété 42: Appartement moderne, confortable au sous-sol. 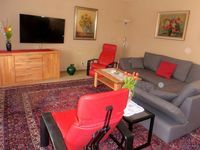 The flat fully matches the description, we found it very clean and well-equipped, with large sunny rooms and a patio, on the ground floor of a 2-storey small building. It is not in Bad Wildbad proper, but in a hamlet overlooking the town on top of a steep hill, next to a forest which seems to be a focal point for hikers and mountain bikers. It is also close to the entrance of the 'Baumwipfelpfad', an elevated walkway which takes you to the top of the trees and is well worth a visit. There are some good restaurants nearby, but all the shopping should be done downtown. We got a nice welcome from the owners who told us everything we needed to know about the flat and the surroundings. The area is very quiet, and is a good starting point to visit North Schwartzwald, and places like Baden Baden and T&uuml;bingen. The only shortcoming for us was the lack of internet connexion (since there are very few hotspots in Germany), but that was no big deal. We will definitely stay there again, should be come back to the area.